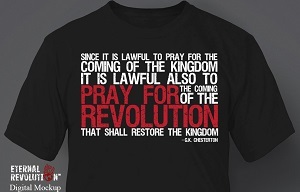 If you’ve ever received an email from me, I use a non-standard closing: “Pray for Revolution.” It’s a phrase that appears throughout the site here at Eternal Revolution and there is even a shirt design using the phrase. I realized I never explained the source anywhere on this site. I admit, it is an unusual prayer request. It comes from Chesterton’s essay The Wind in the Trees, collected in Tremendous Trifles. Chesterton’s point in the essay is that just just as the invisible force of the wind moves the trees, so too does the invisible forces of spirit come before the violence and madness of human revolt. “No man has ever seen a revolution,” G.K.C. summarizes. It is certainly not the popular interpretation of the Lord’s Prayer. Yet as with most Chesterton quotes, once he points out the odd interpretation in makes a great deal of sense. We pray for the coming of the kingdom. We pray for His will to be done on earth. And what He said he came to bring was a fire that would consume the earth. Does that fire consume the earth now? Does it even consume you? Is there a zeal, a passion, burning in your soul like the bush that spoke to Moses, or that pillar of fire that led the people of Israel through the desert? If not, then pray for the revolution. Pray for the turning (volution) again (re) of your heart and mind back to the things of God. Turn away, again and again, from the things of this world. All we can directly effect with our own will is our own person. The eternal revolution for which we pray every time we say the Our Father is therefore first and foremost an internal revolution. When properly burning within us, it will catch on to the world around us. Nurture the flame of the spirit within yourself. Discipline your self, your mind, and your heart to follow the Lord’s will more and more closely every day.